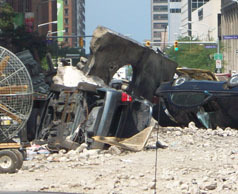 NYPD cars, rubble, explosions and New York street signs, all might seem common if you were in NYC, or even a soundstage in L.A., but this is Cleveland! 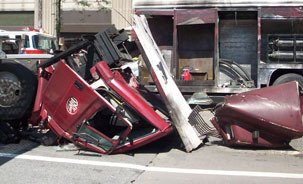 The props were all brought here by the Marvel Comics crew who are in Cleveland this month shooting scenes for next year’s Avengers film. It’s usually the talk of the morning news… who has been there to see the filming, what they have seen, stars spotted (or lack of) and what roads are closed. For the most part, it’s not like a visit to the Universal Studios lot. The action is sporadic and sometimes disguised with smoke blown by giant fans, so you have to be in the right place at the right time. We arrived at the area seeing road closed signs so we knew we were in the right place. 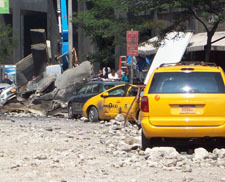 There were several pre-smashed cars, vans and taxis amongst rubble that resembled a typical road construction project. The cross walk was taped off to pedestrian traffic, so from our vantage point we HEARD the car flipping scene, but didn’t get to actually see it. What little we might have seen between obstructions was obscured by the fake smoke blown by giant fans. Then they announced it was their lunch break, so we took the opportunity to cross where it had previously been closed to scope out a better “after lunch” vantage point. We did see a few guys walking around in padded spandex pants containing sensors which obviously have some movie-making magic powers. The downtown Cleveland East 9th street area was hopping with energy, everyone trying to get a better view of the action and taking pictures of themselves in front of the rubble and “fake traffic”. We found a perfect shady spot on the patio of a restaurant that clearly wasn’t serving outside because no one was eating. There was no shortage of movie bouncers with headsets getting increasingly annoyed at people loitering on the sidewalk. It was as if they thought the same people from 5 minutes ago weren’t following their instructions, but it was really new sets of people. A humorous exchange if you were an innocent observer on the safety of the approved viewing spot. 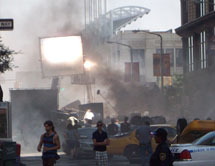 We could see the crains of large diffused lighting and cameras getting into position down the street. Then just before the action started, they decided to clear the restaurant patio, so much like herding turtles, they cleared the patio and sidewalk to a spot down the street. Seeing this was going to get us nowhere but bored, we decided to move to the other end of the closed street through alleys. On the way we did see the commissary, but nothing exciting was happening there. On the other end of the street we did have a different view, but much the same as the other side, the action was far away. We did get to speak to an extra who described his experience applying to be an extra, waiting 4 ½ hours in the hot sun in a suit. He hadn’t done any filming yet, but was scheduled to report in a tuxedo the following Monday, for $10 per hour. A young college freshman with a headset in charge of keeping the sidewalk clear was answering questions about working on the crew. She told the crowd they usually work 12-14 hour days, standing, and she got the job because she interned for a movie last summer. She really went the extra mile with her best bubbly customer service charm to keep the crowd entertained, in a completely different way than the bouncers on the other end of the street. After another 30 minutes in the hot sun with nothing much to see, we decided to call it a day. After one visit, and reports from my inside source having a birds-eye view of the action, I absorbed enough of the movie-making excitement to go back for more… especially since I heard today there were explosions! Stay tuned.